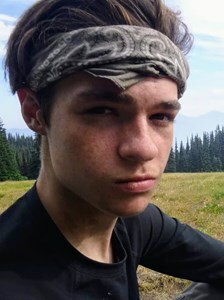 Rowan Morgan Rogers Padgett, 17, died March 29th, 2019 in Olathe, Kansas. Rowan was to graduate from Olathe East High School in a few weeks, and was excited about his future. He loved people, and loved talking them into things, and had planned a career in sales. Despite being only 17, he applied for a job with Colonial Life, where he impressed the recruiter so much she offered him a job when he turned 18, in a few weeks. More than anything, Rowan loved his friends. He had the fastest texting thumbs we’d ever seen, and kept up conversations with many friends at the same time, often far past his bedtime. School was a thing he did, people were his true passion. He gave great hugs, he smiled easily, he cracked jokes about everything and hated his parents’ puns. He also loved the outdoors, going for walks to a pond hidden in the woods near his home. He played violin for more than 10 years, starting at the age of three, with the Ottawa Suzuki Strings. Rowan was born April 13th, 2001 in Overland Park, Kansas. He is survived by his mother, Semie Rogers, brother Alex Padgett and stepfather, Tom Pond, of the home, father, Weldon Padgett of Kansas City, grandparents Ben and Mary Nelle Rogers of Overland Park and Patricia and Peter Rogers of Pleasant Hill, California, stepbrothers Ben Pond, Nate Pond and Max Pond, stepsister Lindsay Pond (Robert Gutierrez), aunts Mary Clasen (Michael), Melissa Padgett, Libby Nelson (Dave), uncles Lewis Rogers, George Pond (Kathy Whiting) and Jim Pond (Christy). He is also survived by his dog Astro, who misses his boy terribly. A memorial will be held Friday, April 5th at Thompson Barn in Lenexa, Kansas. Gathering and reception at 6:30pm, with a memorial tribute being held at 7:15pm. If you have a hoodie, please feel free to wear it. In lieu of flowers, the family requests donations to The Brady Center to Prevent Gun Violence or any similar organization, or the Nature Conservancy. To leave a message of condolence, or share a special memory of Rowan, click the Share Memories tab above.